Search-form presets - search for 'economy' and 'compact' car at the rental location 'Sanremo - San Remo'. Address: Piazza Colombo 28, Sanremo Im Roma, Italy. If your budget is limited, it is better to book a car in advance, since rental rates increase with decayed availability of vehicles. Quite often, the cheapest options of golf-class cars in Italy can be found in airports. The most popular models representing the mini, compact, and economy car segments in Sanremo are: Citroen C3, Toyota Corolla, Toyota Auris, Opel Astra, VW Golf, Ford Focus and others. When hiring a budget hatchback, it is definitely worth saving on insurance deposit (franchise). Deposits on small cars in Italy vary from 100 to 1.000 euro/dollars. Check the rental conditions of each car in your selection to find a vehicle with a minimum deposit. If your routes in Italy are foreseen to pass through hilly areas or mountains, it is not recommended to consider very small cars for rental. Their engines are usually insufficient for a confident driving on the roads with long or steep climbs. At the rental office in Sanremo, consider to take a 'Breakdown Assistance' package or ask an officer for a contact data to use in case of a vehicle breakdown. Cheap cars are sometimes unpredictable in operation. OrangeSmile.com wishes you a safe and great trip to Sanremo! Drivers are prohibited to use radar detectors. Even a transportation of such a device can be the reason for a fine of up to three thousand euro. The punishment also includes the immediate confiscation of the device, regardless of the fact whether it was used or not. Only a few decades ago usual intersections with traffic lights could be seen everywhere in Italian cities. Today, they have become a true rarity. According to one version, previously a large share of accidents occurred at intersections, so they were gradually replaced by safer areas with a circular motion. Riding a car in major cities of Italy is quite dangerous for inexperienced tourists. After having reached the right place, it may take sometimes a few hours to find a free parking space. Quite often the efforts of inexperienced foreign visitors are simply in vain – there are simply no free parking places in the center of large cities. 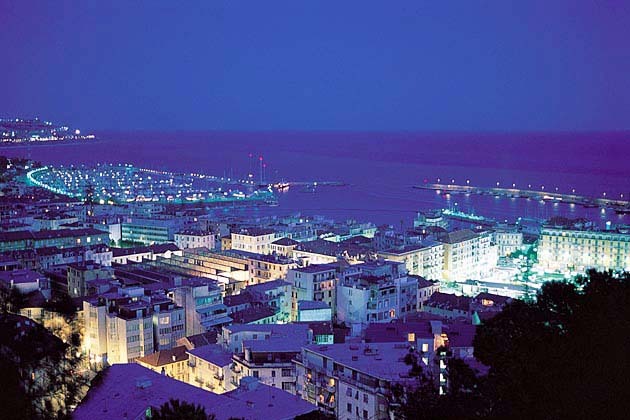 San Remo is a city with a rich cultural life offering its guests to take part in the brightest and most exciting events, holidays and festivals. Local festivals always attract many travelers from all over the world. The small city of San Remo owes its popularity and global recognition to scale festivals and grand celebrations held there all the year round. The San Remo Music Festival is one of the global scale events held in the city. The festival was first held in 1951 and since that time the festival has turned into a great annual tradition. The celebration of the festival falls within the first week of March. The festival engages the best musicians of the country. For many singers and musicians the San Remo Music Festival has become a career launch platform. The Flowers Parade is one of the most spectacular and symbolic events in the cultural life of the city. The matter is that flowers are the main symbol and a genuine national pride of the city of San Remo. The flowers can be seen everywhere in the city. Flowers are used as main decorative elements of concert stages and streets during festivals and holidays. A parade of cars with incredible flower constructions is held on the last Sunday of January. The city witnesses hundreds of luxurious cars decorated with thousands of fragrant flowers. Local musicians and actors clad in special festive dresses accompany each flower car. A tradition to celebrate this unique and marvelous festival was started far in 1904. Then the holiday had another name and another theme. The celebration was devoted to the Goddess of nature named Flora. A hundred years ago the festival was accompanied with original rituals and ceremonies. In the middle of the 20th century the festival got a name of Flower battle. The festival got its recognition and popularity among local folks rather fast.